The subtle change in the diameter of a glass can hide large changes in volume. Unfortunately for us, we’re terrible at estimating this, even when we logically know it to be true. 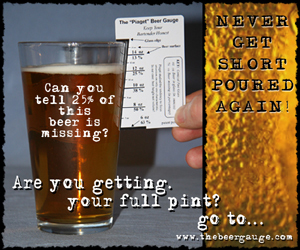 For example, a few millimeters at the top of a pint glass equals an ounce of liquid, while the same height measure at the bottom of the glass is far less. If you’re concerned about getting a “short pour,” you can use a rule of thumb (“Is the liquid more than one finger width from the top of the glass?”) but to be truly accurate you need a measurement tool. Look no further! 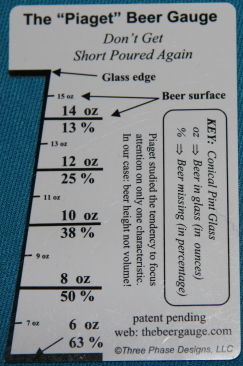 The folks at Three Phase Designs have created a pint-glass ruler that will tell you exactly how much liquid is missing from your glass. These informative photos are from their site. For those who haven’t taken or don’t remember their Intro Psych class: Piaget was a child development researcher who studied the errors children consistently make concerning the world around them. He used these errors to define “stages” of development… and one of the stages is represented by errors of “conservation.” Conservation means that an object retains its proportions despite changes in arrangement. For example, small children think the same amount poured in a tall thin glass is “more” than that amount poured into a short, thick glass. Though we eventually become accurate for these simple problems of conservation, there are many instances (such as the beer glass) where we still have difficulties. See also “guessing how many miles lie between your car and the mountains” while driving toward them.